I think most people like to eat good, fresh pineapple but we might be reluctant to buy one because we simply have no idea how to tear into one. They are a bit intimidating. So here's how I learned to cut pineapple in cooking school. I do think it's a great method. Take the pineapple and a good chef's knife and slice off the top and bottom, about one inch from the ends. Those are discarded unless you want to keep the top for some kind of garnish. 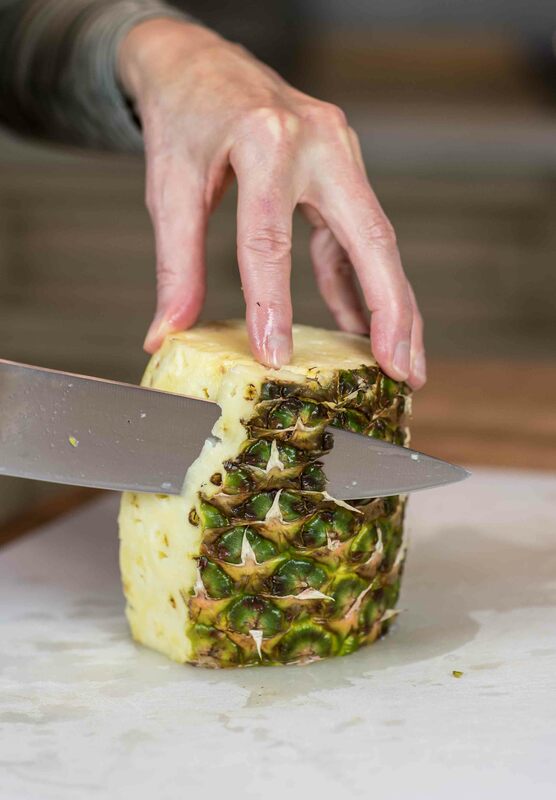 Set the pineapple upright on one of the ends and then start slicing off the side skin in long vertical strips. Go deep enough that you remove the eyes and all dark indentations as you slice and try and follow the contour of the fruit as you move from the top to the bottom. When the fruit is peeled, quarter it lengthwise and then remove the triangular core of each quarter. At this point you can cut the pineapple into whatever size pieces and slices you need. Because my husband and I can never eat a pineapple in one sitting I will usually cut off the top of the fruit (I leave the bottom in tact) and then I cut the fruit in half with the intention of cutting and using half of the fruit at one time. I then wrap the remaining half with plastic film, stick that in the fridge and it holds well in it's half size for several days. And...how do you know if a pineapple is ripe? That is a tough question and I still don't get it right every time. When my husband and I were in Hawaii I toured the Dole pineapple plantation and they said the proper way to select a pineapple is to judge it by the shape of it’s exterior design, which are called the eyes. If the eyes are consistently large from top to bottom, the fruit is mature. But if the top eyes are smaller than the bottom eyes, the fruit was picked before maturity. And one more thing. At the Dole plantation cafe they were serving a chili that had chunks of pineapple cooked in it (or added at the tail end of the cooking period). It was heavenly. If you like chili and you like pineapple it’s something you should try.